A big congratulations to Kitty Bee from Brighton! You have just won yourself a pair of our beautiful fans!!! Please email jen@froufroufeathers.com to claim your fans! And as a thank you to all who participated, we would like to give you a special discount of 20% off our ostrich fans. Have a very feathery Christmas! Hasn’t Christmas crept up on us quickly this year!? It feels like only yesterday I was sunning myself on the beach (when I say ‘sunning myself’ what I really mean is staring up at cloud – and when I say ‘beach’ I mean beer garden). 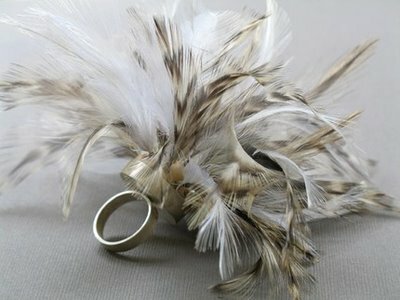 Obviously, the feather enthusiast in me tries to use feathers in EVERYTHING I do, of course Christmas is no exception. Here are a few ideas to make your festive season a feathery one! One of my favorite feathers to use in my Xmas decorations are marabou feathers. So versatile, fluffy and angelic. You can literally add them to anything – table decor, stuff them in stockings, embellish your tree top angel. The possibilities are endless! Try sticking them on baubles, or IN baubles. You can actually buy clear fillable baubles, open them up and stick a few marabou feathers in, such a nice touch! Why not try it with peacock feathers too! You know Santa loves a bit of fringe – who doesn’t!? Spruce up your stocking this year with some ostrich fringe. Any kind of fringe would work really, chandelle, goose etc. Have a look at some of our fringes here and use your favorite! I had to make this picture extra big so you could truly appreciate the beauty! AMAZING! The natural colours of the peacock feathers make them perfect to use on your tree. It’s such a simple yet effective way to add a stunning twist to your Xmas tree. I will definitely be using this as my inspiration this year! So get inventive with your decor this year, I know I will! Are you a Feather Fan-atic? OK, so I’m quite aware (and a little self concious) that with my lack of ‘followers’ I am in fact writing to no-one, how sad! So in order to boost my blog a little I have decided to do a special burlesque fan give-away! My love of burlesque has grown and grown ever since I saw my first show in Chicago. I remember it vividly… It was the summer of 69… Just joshing! Fancy a free pair? It’s really rather simple! Preferred fan colour – Click here and scroll down to see our colour card. Good Luck to everyone, and don’t forget to tell your friends! No, not bright copper kettles or warm woolen mittens. Who wants a bright copper kettle when you can have these…. OH MY. This is just beautiful!! A bit more than I would usually spend on a headband, but have you seen it!? It is without a doubt worth splashing out on, especially with the festive season approaching! Sheena Holland creates one of a kind, vintage inspired pieces. Combining feathers with antique jewelry. Her designs have been seen on celebs such as Pink & Lilly Allen. I simply adore these feather hoops from Topshop. And oh so affordable at only £12.50. And with hoops and chandelier earrings being in this season they are bang on trend… oh, and did I mention, they’re sooo pretty? Mine, Mine, Mine! Ok, so maybe its a little over my budget… alright – A LOT over my budget, and it doesn’t help that its from the US of A either, but that doesn’t mean I can’t drool over it. J’adore fringe!! There are so many stunning ostrich fringe dresses out there at the moment. This one being one of my many favorites, a great twist on the LBD. Teamed up with a pair of killer ankle boots and I’m all set… Merry Christmas to me! Ok, I’ve Salivated enough for one day! So rock the look and ruffle some feathers people!